The chapter starts with the group of Riders composed by Lute, Llia, Debli, Hyoro, Mille, Genie and Stone…And Navirou. The group faces a crossroads and divides themselves in 2 groups. One composed by Lute, Lilia, Navirou and Debli; the second one conformed by the other part of the group. Before going, Lilia tells Mille that if they get lost they only have to follow the Lightning. In any case the group divides and they start checking for the Kinship Ore. Meanwhile Simone is going with her Lieutenant towards the Forest of Confusion. Simone then starts telling her story. When she joined the Scriveners, she was sent on a mission towards the that Forest; in there, she got lost and couldn´t find the other members of the team, a heavy downpour was coming from the sky and it all seemed that she was done for; a Lightning appeared, and for some reason she started following it, like it was a guide towards her salvation. Then, suddenly a giant fog came and she sought a Creature in the middle of it. After that she vanished. Simone woke up in a strange house, it seems that she was found unconscious outside the Forest and a villager took her to take care of her. So now, Simone wants to go back and give her thanks to her savior; also she would like to research the forest and publish to the world her findings. Back with our Heroes… It seems that Lute´s group is lost since they went back to the crossroads, so now that they went one route, they will go to the other one now!... And the got lost… Again! Although now Debli is not with them; but he is near since he yells every time Lute or Navirou screams “Tubli”… So they went and search for him until they reached a cliff. Suddenly a heavy rain comes in and Lilia trips with a tree root, damaging her leg and letting go her backpack. Suddenly Tub…Li, I mean Debli appeared and he had some insects that are very, very expensive on his hands, he was grabbing them. Now that he is here they can continue, although Lilia has hurt her angle so she can no longer walk for the time being. The group keeps advancing with Lute Carrying Lilia and Debli carrying Navirou for some reason. They stop to rest and Debli shows that he grabbed Lilia´s Backpack and she is grateful with him for getting it back. Suddenly lightning starts appearing and they start following it, they reach a fog after it…And in the middle of it a Horse-like Monster was in there… The Kirin. Kirin, the Ancient Dragon, beings that are considered either miracles or Walking Natural Disasters, they don´t have a clear environment; The Kirin attacks with it´s powerful tackles, kicks and lightning which can envelop his body or throwing it off in Lighting form. They are also known because the armor made with their parts are…Quite fan-servicey. Navirou doesn´t know what Monster is that; but his sudden movements seem that it is trying to tell them something… For Debli, he just want his horn, because it seems that it can get him some good money! The Kirin starts attacking him so Lute enters the action in order to defend Debli! The Battle continues and Lute uses his new Kinship attack, the Sky-High-Extreme! The Kirin attacks too and both of them clashes! Lute and Navirou wakes up in a strange place; The Kirin is in there, the Ancient Dragon electrifies Navirou and contacts him with Lute that way, Navirou gives the message which it basically is that he and creatures of this forest just wants to be left alone, to protect their home; Lute can understand that since Hakum village is the same, still he wants tor each the Kinship Ore… The Kirin showed it to him and Lute goes and tries to activate his Kinship Stone. Meanwhile Debli and Lilia are trying to wake both Lute and Navirou. Simone and her Lieutenant comes to them and she wakes them up; The other group also appears. Lute wakes up. Lilia explained to Simone what happened and Simone says that the Monster they saw was a Kirin. The fog ceases and the Kinship Ore can be seen, Lute gets near it, it´s not contaminated; Lute touches it and it´s light gets into his Kinship Stone. After that the group leaves, Genie, Stone, Mille and Hyoro will go back to Hakum. They say that when Cheval is ready to come back they will be there for him. Lute, Lilia, Navirou and Debli goes back to Gildegaran and to continue their mission. Meanwhile Simone and Her Liutenant goes back she says that she will not publich or make notes about her findings… Since there are things that are better be left off as a Mystery, behind them the Kirin was looking them, Simone turns around and see him, in the blink of an eye he disappeared, she knows that a Kinship is joining them now. An Ok chapter, it wasn´t as cool and well, I felt it slow. Still that doesn´t mean everything was bad since we got some funny parts with Debli! Other point that I liked was the Kirin, that magnificent beast! 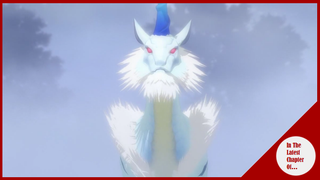 He looked awesome and it is cool that an ancient dragon, even if it´s one of the smaller, like the Kirin made it´s appearance. Othe point that I think it´s important is that it seems that both Mille and Hyoro are out of this story, at the very least until the end of this comes, this is because they are going back to Hakum Village, so their days of adventuring on the world and stopping the Black Blight has come to an end… Now the only Riders facing this are Lute, Cheval and Avinia.